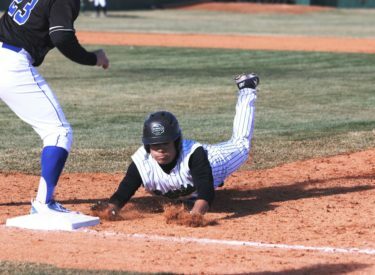 The Seward County Saints got their 2017 season started off on the right foot Saturday afternoon at Brent Gould Field in Liberal, sweeping McCook 7-4 and 16-4 to begin the year 2-0 for the first time since 2013. It took a while to get any offense going for either side as Seward was first to crack the scoreboard in the bottom of the 2nd when Errett Edwards singled with two outs to give the Saints a 1-0 lead and Braxton Allen tripled to the gap in right center to plate two more to put Seward up 3-0 after two. McCook answered right back, getting their first runs of 2017 with a one out single to drive home a pair, quickly cutting Seward’s lead back to 3-2. Seward gifted the Indians two more runs in the top of the 4th inning, committing three errors to give McCook their first lead of the afternoon at 4-3. It remained a 4-3 game in favor of the Indians until the bottom of the 5th when Dylan Paul singled to start the frame for Seward and Cody Stineman blasted the Saints first home run of 2017 to put the good guys back in front 5-4. In for his second inning of work out of the Seward bullpen, Jonathan Castillo stranded a pair in the McCook 6th to hold the lead at 5-4. Seward added a pair of insurance runs in the bottom of the 6th, but Castillo wouldn’t need them as the sophomore righthander worked a 1-2-3 top of the 7th, extinguishing any chances of an Indian comeback as the Saints hung on to win 7-4. Seward outhit McCook 10-5 in the game, but committed 5 errors, leading to a pair of unearned runs to allow the Indians to hang around most of the game. Brendan Madsen finished 3 for 3 with a pair of stolen bases in his Seward debut while Errett Edwards was 2 for 3 with a pair of runs scored. Castillo earned the win out of the Seward pen, going the final three innings without allowing a run while striking out two in the process. It didn’t take long for the Indians to get on the board in game two as they ripped a leadoff triple and got a single behind that to quickly take a 1-0 lead in the 1st. Seward answered in the bottom of the 1st as Stineman drove one in with a fielder’s choice, but the score wouldn’t stay tied for long as McCook tallied another run in the top of the 2nd to go back in front 2-1. Neither team could push anything across the next 2 ½ innings and after four it remained a 2-1 game in favor of the Indians. McCook chased Saints starter Brian Tims from the game in the 5th and plated a couple off of the Seward bullpen to push their lead to 4-1. Seward cashed in on a pair of McCook errors in the 5th to get back to within one and didn’t stop there as Addison Kaasch drove home two more with a double and Stineman lifted off on his second home run of the day to put the Saints back in front 7-4. Ethan Earhart worked a quick 1-2-3 top of the 6th for Seward and the Saints were right back at it offensively in the bottom of the frame. The Saints plated their first run on a balk and got an RBI single from Paul to make it a 9-4 game. A sacrifice fly from Kaasch scored another and a two run single from Jared Biddy blew the game open at 12-4. By the time the dust settled, the Saints had themselves a seven run inning to take a 14-4 lead after six. Earhart worked out of trouble in the top of the 7th and after stretch time, Seward added two more on McCook’s fifth error of the game to pad their lead to 16-4. West Reddell threw up a zero in the 8th for Seward and Jordan Pepper did the same in the 9th to close things out, giving the Saints a 16-4 win to finish off the sweep. Each team had 13 hits in the contest, but it was 5 McCook errors leading to 14 unearned Seward runs that was the difference. Three Saints relievers combined to throw 4 2/3 scoreless out of the Seward pen to preserve the win for Tims who went 4 1/3, allowing 4 runs while striking out 4. The middle of the Seward lineup was deadly in the win as Kaasch and Stineman combined for 6 hits and 6 RBI’s while also scoring 5 runs. Seward opens the season 2-0 for the first time since 2013 with the sweep while McCook begins their 2017 campaign 0-2 ahead of a 10 day layoff. The Saints next action will come in Dallas when they take on Galveston in a four game set at Justin Northwest High School Friday, Saturday, and Sunday in the Lone Star State.